Pew’s latest research on local news was released this week and it largely confirms what those of us working in the local journalism space already know: that people are still moving to digital, that trust in local news is important, and that age, race, and income matter for local news behaviors and attitudes. This is the case nationally, and for New Jersey as well. The report features a cool interactive element that lets one search for data about specific areas (they use core-based statistical areas, or CBSAs, which are basically urban-metro areas). 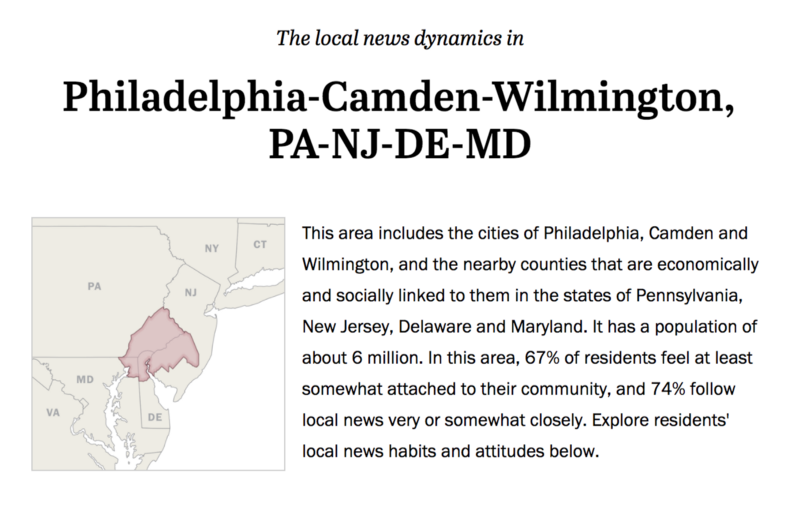 Pew provides data for three of New Jersey’s six CBSAs: greater New York City, greater Philadelphia, and greater Allentown, Penn. Note that this excludes the areas near Vineland, Atlantic City and Ocean City in South Jersey. Those in the Philly and NYC markets (which includes most of New Jersey) said they get news from television at a margin higher than the general population, which makes sense given the number of outlets in this region of the country. Both also report accessing local news via mobile at higher rates than the average, which again makes sense given the economic and racial diversity of those two areas. 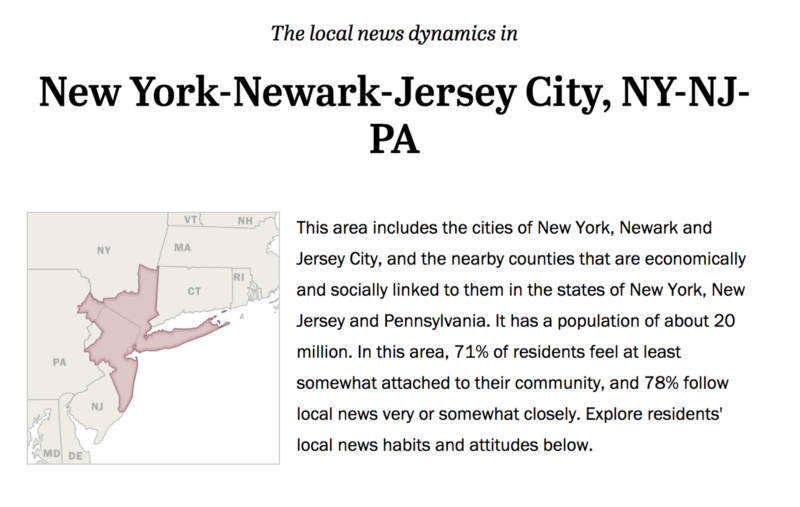 60% of respondents in New Jersey felt their local news was connected to the community. 50% reported that the local news actually covers their community, as opposed to a nearby community. 15% have paid for local news. Pew’s survey was large, covering 35,000 adults. The first finding in the national study was that online access is nearly equal to television as the way people are finding local news. For a long time, television has been the number-one way that people have gotten local news. Now, 37% (to television’s 41%) say that they get their local news online (either through a website or social media). This is important because of the general inferiority of local television news to that produced by nearly every other medium. Given its focus on weather, crime, and news-you-can-use, local TV news is sometimes criticized for covering the sensational over what are sometimes called “critical information needs” such as government accountability, health, education, and the like. However several efforts are currently underway to change this reputation, including by the Knight Foundation, Northeastern University’s School of Journalism, and the Cronkite News Lab. Importantly, infrequent local news followers are 14% more likely than very close followers to get their news online (hold that number in your head for a moment). 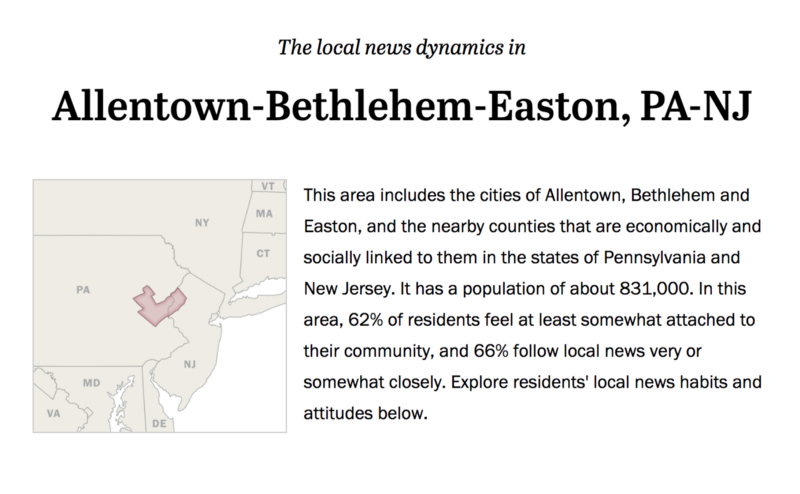 Whether audiences feel that their local journalists are connected to the community turns out to be an important indicator of all sorts of positive assessments of local news, though far fewer people have personally experienced a connection to a local journalist. One presumes (though does not know based on the reported data in the survey) that this includes things like appearing at Fourth-of-July parades, including references to specific community members or goings-on in their content, or otherwise being seen to be engaged with and knowledgeable about the specific place on which they report. (I remember one local weatherman using photos of local kids in their season-specific weather outfits during his weather reports, which, looking back, makes me smile). Not surprisingly, age, race, income, and access to broadband also effect attitudes toward and behavior around local news. Residents in areas with more people of color say that local journalists should voice their opinions more and are less likely to say that those journalists are in touch with their communities. Residents of lower-income communities and areas with less-broadband access are more likely to get their local news via the television, but when they do get local news online are more likely to do so through a mobile device. Crucially, areas with lower voter turnout feel less of a connection with local journalists, and are less likely to say that their local news covers the area in which they live. In fact, 47% of those surveyed said that their local news does not cover the area in which they live. This reflects the ongoing crisis in local journalism that is due in large part to layoffs and closures of local newsrooms. One thing that jumped out at me throughout the report was how much the findings might have to do with age, and to a lesser degree, with race. Digital-natives will eventually become local journalism’s target demographic, which is old people. Likewise, the U.S. will be a minority-majority country by roughly 2045. One assumes that digital access will become the clear favorite as digital-native generations get older; what will this mean for the medium-specific constraints and affordances of local news on television, and equally of the internet? Those infrequent local news followers who currently get their news online need to be converted into frequent local news followers. The Pew survey also found that whether people pay for their local news and recognize the crisis is correlated with how they access it: people who access via print are more likely to know that times are hard, and are also more likely to have paid, likely through a subscription. People who access local news online — perhaps because of a more fragmented news diet, and because most content online is available for free — do not recognize the crisis and have usually not paid. This does not bode well for long-term efforts to get people to become members or subscribers to their local news outlets. Race is important too, though for different reasons. If people of color are less likely to trust their local news or to find their local journalists to be connected to the community, then all of those positive effects are likely to be missing; for example, the report found that less trust and affection means a lower rating for accuracy, usefulness, transparency, and fairness. Though not a new problem, the report highlights the fact that if communities don’t have faith in their local news, other important institutions may also be at risk. Conversely, when people trust that their local journalists are holding the powerful accountable and making them heard, there are all sorts of other positive benefits. Pew’s full report is available on its website. About the Center for Cooperative Media: The Center is a grant-funded program of the School of Communication and Media at Montclair State University. The Center is supported with funding from the John S. and James L. Knight Foundation, the Geraldine R. Dodge Foundation, Democracy Fund, the New Jersey Local News Lab Fund of the Community Foundation of New Jerseyand the Abrams Foundation. Its mission is to grow and strengthen local journalism, and in doing so serve New Jersey residents. For more information, visit CenterforCooperativeMedia.org. Sarah Stonbely, PhD is the Research Director of the Center for Cooperative Media, in Montclair, NJ.